Tape Ark are thrilled to announce that the company has been chosen to store historical archive tapes containing valuable NASA data from the moon. There are 173 original 7-track magnetic tapes marked "NASA Manned Space Center”, carrying data that was recorded on the moon. The data and tapes belong to Australian Physicist and former NASA Principal Investigator Professor Brian J. O’Brien, who invented the DDE and other experiments while working with NASA at RICE University in the late 1960’s. The importance of this historical data has been re-emphasised recently with China’s plans to put a rover on the moon and of course SpaceX planning trips to the surface of Mars. 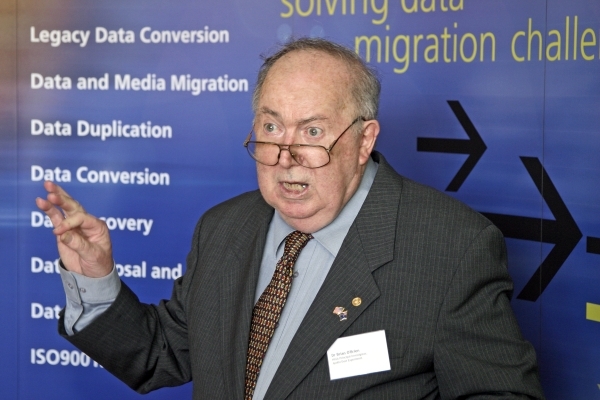 Guy Holmes, Tape Ark’s Founder and CEO originally assisted in the retrieval of the magnetic tapes, and is thrilled that Tape Ark have been appointed to be the custodians of the data for Professor O’Brien. The data from these tapes are now safely stored in the Amazon Web Services based Tape Ark Online Portal System for easy access and downloading, making the need to maintain and store the bulky original 7 track tapes unnecessary. Guy Holmes said this week “The Tape Ark storage platform is a perfect fit for these tapes. The bulky original tapes that contained less than 1MB of data each cost over $250 per month to store in offsite vault storage, but in the Tape Ark portal, the entire data set from these tapes costs less than $0.10 per month. Not only is if far more cost effective, but Dr O’Brien no longer needs to worry about maintaining hardware or software to read the tapes again. Add to this, that the data can now be accessed from anywhere in the world, can easily be shared with other space agencies and used for future planning and experimentation, and it becomes obvious why this is such a great solution for the data”. In addition to storing data from the moon, Tape Ark is also currently undertaking several other data management projects of cultural and/or international significance for several companies which include media/news organisations and international resources companies. Large volumes of aging archive tape media which has until now been slowly decaying and being lost whilst stored in offsite long term storage is now being recovered and migrated to the cloud, where the data is no longer at risk and is immediately accessible for big data and analytic tools. The data was gathered from the Lunar Dust Detector Experiment (DDE) conducted during the Apollo moon landings nearly 50 years ago. It provides valuable information on dust and temperatures on the moon, shortly after Neil Armstrong stepped into space history in July 1969. The matchbox-sized Dust Detectors were placed on the Moon by US astronauts in the Apollo 11, 12 and 14 missions. These collected many months of measurements and it is a very valuable and one-of-a-kind collection of data. According to NASA's website Professor O’Brien’s data represented, "the only long-term information on the lunar surface environment, and as such are ideal for planning future lunar missions. Scientists researching future landings and take offs from the moon and other planets such as Mars currently only have theoretical models and guesswork to base their studies on. Neither computer models of theoretical effects nor Earth-based simulations can provide realistic forecasts without actual data from the Moon – which is what these tapes contain.